Custom Chest Loot Mod is the perfect solution for anyone who are eager to customize your bonus starter chest, see mod items in dungeons, or simply wanted to make your Minecraft’s trunks full of junk. This tiny mod simply allows you to customize all randomly generated container (chests, dispensers, etc.) content and the number of items generated in those containers. All container categories (including ones added by mods, if any) are completely customizable in the properties files! This mod will do nothing if you do not edit its properties. The properties files are generated in your .minecraft/config/CustomChestLoot directory. This mod is very simple – it allows you to customize all randomly generated chest content. Just plug it in, run Minecraft once to generate the properties files, edit whatever you want, and restart Minecraft. Bam! Customized chest content! Be aware that some items may change when generated! Enchanted books will have a random enchantment applied and modded items will change into whatever they are modded to change into. There will be no variance in these items within a single chest (e.g., all enchanted books in a single chest will have the same enchantments) unless that chest has been filled multiple times by a mod. 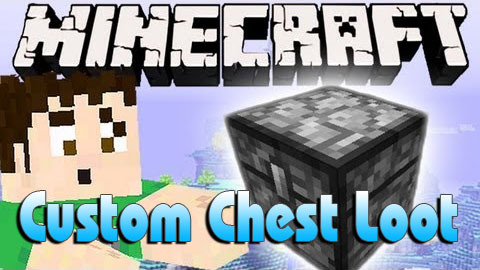 Your Custom Chest Loot properties are located in .minecraft/config/CustomChestLoot. Once you’ve run the game once, the folder will be generated with a text file in it for each chest type. Open it up with any text editor to change its loot table and quanitity. itemId is the item’s id. itemDamage is the item’s damage value (optional – if you do not put this in, the item damage will be 0). stackSize is the size of the stack – this can either be a number or a number range (e.g. 2-3). weight is how commonly the item will be chosen, relative to the other items in the same category. Each item should then be separated by a comma (,). All items must be on the same line, starting with “contents=”. You are also able to add drops on multiple lines. Be sure you include “content=” in front of each line! This is highly recommended to keep drops you’ve added separate from the defaults. You may use any number of spaces between different parts and symbols, if you want. Don’t put spaces in the middle of a number or word. You may also change the number of item stacks to generate for a chest type. Simply put “count=” and a number or number range (e.g. 2-3). If you ever want to start over, or the game is updated (or you install a mod) to where the default chest gen is different, all you must do to update or restore your defaults is delete the properties files you want, and the mod will generate fresh ones that are up to date with the latest information. If you’ve separated the things you added and made backups before you deleted the old files, it’s easy to re-add your changes to the updated defaults. However, there’s no easy way to re-remove items. You may want to take note of the items you removed somewhere.